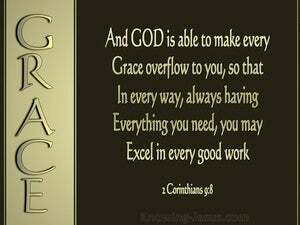 And God is able to make every grace overflow to you, so that in every way, always having everything you need, you may excel in every good work. Besides, God is able to make every blessing of yours overflow for you, so that in every situation you will always have all you need for any good work. And God is able to make all grace (every favor and earthly blessing) come to you in abundance, so that you may always and under all circumstances and whatever the need be self-sufficient [possessing enough to require no aid or support and furnished in abundance for every good work and charitable donation]. And God is able to provide you with abundant gifts, so that you will always have plenty of everything, and that you will also have plenty for doing every good deed. And God is able to make all grace abound toward you, so that you, always having all sufficiency in everything, may have an abundance for every good work. 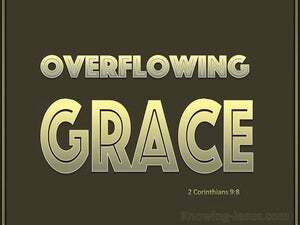 And God is able to cause all grace to abound to you, so that in everything at all times, [because you] have enough of everything, you may overflow in every good work. 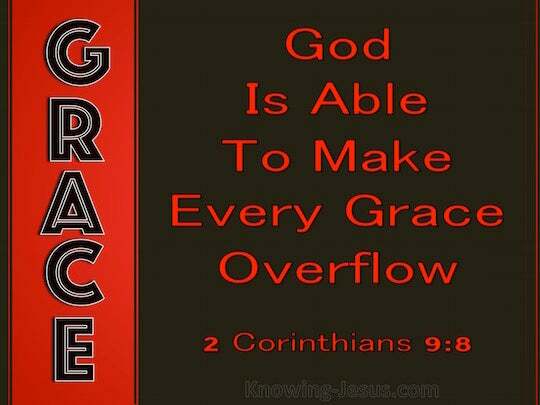 And God is able to make all grace overflow to you so that because you have enough of everything in every way at all times, you will overflow in every good work. God has power to shower all kinds of blessings upon you, so that, having, under all circumstances and on all occasions, all that you can need, you may be able to shower all kinds of benefits upon others. 7 Each one must do just as he has purposed in his heart, not grudgingly or under compulsion, for God loves a cheerful giver. 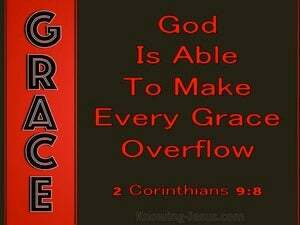 8 And God is able to make all grace abound to you, so that always having all sufficiency in everything, you may have an abundance for every good deed; 9 as it is written, "HE SCATTERED ABROAD, HE GAVE TO THE POOR, HIS RIGHTEOUSNESS ENDURES FOREVER." "Both riches and honor come from You, and You rule over all, and in Your hand is power and might; and it lies in Your hand to make great and to strengthen everyone. Amaziah said to the man of God, "But what shall we do for the hundred talents which I have given to the troops of Israel?" And the man of God answered, "The LORD has much more to give you than this." It is the blessing of the LORD that makes rich, And He adds no sorrow to it. that in a great ordeal of affliction their abundance of joy and their deep poverty overflowed in the wealth of their liberality. But I have received everything in full and have an abundance; I am amply supplied, having received from Epaphroditus what you have sent, a fragrant aroma, an acceptable sacrifice, well-pleasing to God. But just as you abound in everything, in faith and utterance and knowledge and in all earnestness and in the love we inspired in you, see that you abound in this gracious work also. you will be enriched in everything for all liberality, which through us is producing thanksgiving to God.